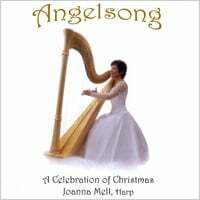 A transcendent collection of beloved Christmas carols in flowing, ethereal arrangements performed on the Lyon and Healy 85 GP orchestral harp, in Joanna's graceful and resonant style. This CD also includes a newly composed tune, "Lullaby for an Angel". A transcription of all the music on the CD Beside Still Waters. 80 pp. Comb-bound. $ 22.00. Multiple order discount available. Six original compositions and arrangements of three Celtic tunes for therapy and meditation. Lullaby for the Lord, Rocking on the Waves, Turning Toward Home, Like Water Over Stones, Jack and Loretta, Miss Hamilton, Kitty Nowlan, The Water is Wide, Memory Waltz. 28 pp. $ 13.50. Samples available; free downloads. Individual pieces also available by download. Samples of Joanna's CDs and books. More original compositions and arrangments of Celtic tunes. Amazing Grace, Suantrai, Lullaby for an Angel, All Through the Night, Suo Gan, Wonderful Peace, Going Home, The Heather is Blooming, Sailing Among the Stars, Following the Brook. 32 pp. $ 13.50. Samples and downloads available. Easy to intermediate. Peaceful arrangements of ten beloved carols. Christ Child's Lullaby, Carol of the Pipers, Dona Nobis Pacem, Away in a Manger, Lo How a Rose, Of the Father's Love Begotten, What Child is This?, It Came Upon the Midnight Clear, Silent Night, The First Noel. 40 pp. Comb-bound. Advanced beginner to advanced. $ 15.00. Preview and purchase samples of Joanna's printed music. Free downloads. Contact Joanna directly for sample and purchase.